Predicting the occurrence of potential dangerous scorpions in an area may be an important tool in preventing serious sting cases. 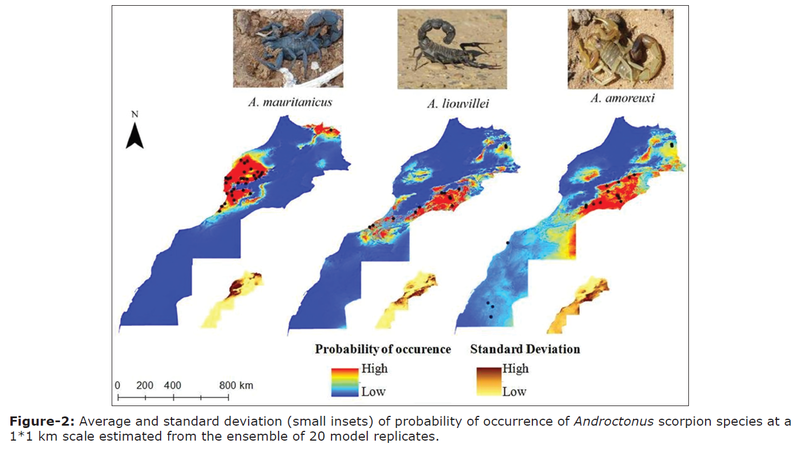 Moulay Abdelmonaim El Hidan and co-workers have published a study where they have identified environmental factors related to scorpion species occurrence in Morocco (the medical important genus Ancrotonus was chosen), and based on this they have developed scorpion envenomation risk maps for the same areas. Materials and Methods: In this study, 71 georeferenced points for all scorpion species and nine environmental indicators were used to generate species distribution models in Maxent (maximum entropy modeling of species geographic distributions) version 3.3.3k. The models were evaluated by the area under the curve (AUC), using the omission error and the binomial probability. With the data generated by Maxent, distribution and envenomation risk maps were produced using the “ESRI® ArcGIS 10.2.2 for Desktop” software. Results: The models had high predictive success (AUC >0.95±0.025). Altitude, slope and five bioclimatic attributes were found to play a significant role in determining Androctonus scorpion species distribution. Ecological niche models (ENMs) showed high concordance with the known distribution of the species. Produced risk map identified broad risk areas for Androctonus scorpion envenomation, extending along Marrakech-Tensift-Al Haouz, Souss-Massa-Draa, and some areas of Doukkala-Abda and Oriental regions. Conclusion: Considering these findings ENMs could be useful to afford important information on distributions of medically important scorpion species as well as producing scorpion envenomation risk maps. Thanks to Carlos Turiel for informing me about this article!